Following the brutal attack on a Catholic church in Anambra State where many were killed, Nigerian writer, Emmanuel Ugwu, has reacted with an interesting piece. The Catholic Church is in a hurry to move on. The church reopened her doors for holy mass one week after a lone gunman walked into St. Philips Parish Ozobulu, shot 12 worshippers dead and left 27 injured. On Saturday evening, the Catholic Bishop of Nnewi Diocese, Most Rev. Hilary Okeke, showed up and ‘rededicated’ the church building, declaring it clean after it was ‘desecrated by agents of darkness’. It’s now public knowledge that the house of worship was donated by a drug baron. But the sanctimonious Bishop chose to brazen it out. His madcap rush to return to the status quo infuriated the villagers. The dead were yet to be buried. And the shameful foundation of that very church had yet to be addressed. First, let’s confirm two basic facts about the Ozobulu tragedy. One, that riotous slaughter on August 6th matched the textbook definition of terrorism. Willie Obiano, governor of Anambra state, said the Sunday morning onslaught that abbreviated the church’s 6 o’clock mass was “a tragic dimension of a long battle between two business partners who are from the same town" and not “a terror attack as we know it." But it was an instance of premeditated violence unleashed on innocents with the intent to cause horror. It’s terror attack… as we pray not to know it! Two, the massacre was the fallout of a long-running drug war. Conspiracy theorists have tried to chalk it up to the invasion of the usual suspects - Boko Haram and Fulani herdsmen. But everything we know about the bone-chilling incident indicates that the terrorist attack on St. Philips Ozobulu was a development occasioned by an internecine feud between two rival drug gangs. The killings have been going on in South Africa and in Nigeria for a while. The vendetta has responsorial murders alternating between the two enemy camps. The Ozobulu massacre was perpetrated by an agent of one of the two dueling South Africa-based Igbo-born drug barons, in the name of settling scores. The gunman first identified and shot the father of a notorious drug dealer before he began to shoot randomly like a madman. It is important to emphasize that the mutual killings that culminated in the Ozobulu mayhem originated from a drug war. To situate that shooting against the backdrop of alternative facts that avoids that reality is to sidestep the crux of the matter. And that can only help perpetuate the problem that led to the disaster. The heart of the matter is that the drug trade the church had been reaping from backfired. The dirty business she had been eating blindly from exploded in her face. The drug trade she has pampered over the years because it yields big offertory came back to haunt her. It invaded the sanctuary of her hypocrisy and exposed her cupidity! 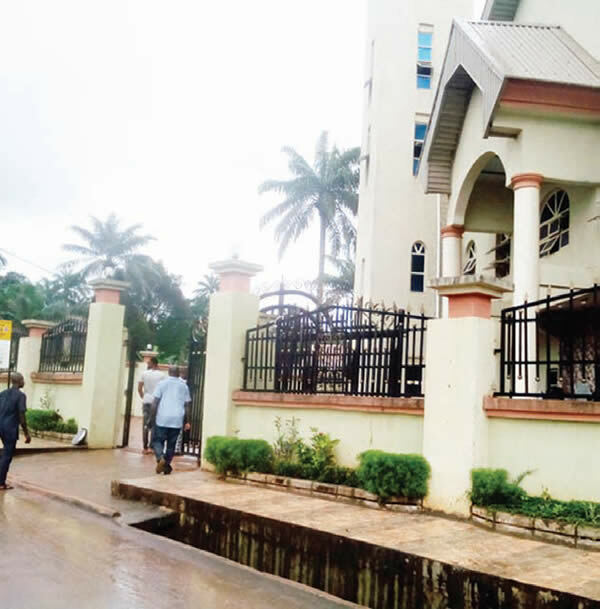 It’s an open secret that Aloysius ‘Bishop’ Ikegwuonwu, the drug lord who was the presumptive target of the shooting, donates church buildings to salve his conscience. At the last count, he has gifted 3 structures to the church, including St. Philips, his village church which was violated by a killer sent to destroy him. ‘Bishop’s source of livelihood was well known. Yet, the church embraced him and permitted him to continue to bribe her with church buildings erected with drug money. The second dedication of the drug Bishop’s church by the Catholic Bishop is a disgraceful attempt to consecrate an irredeemable anathema. It was embarrassing enough that the Catholic church accepted the drug dealer’s church gift and dedicated it. It is even more scandalous that the Catholic Bishop defied shame and proceeded to rededicate the same church building after the whole wide world knew it was built on drugs. The Ozobulu killing was inhuman and indefensible. But it was drugs fighting back. A church that sprang from the foundation of drugs attracted drug war related violence to itself. The church must now pause and search her soul. She must ask herself how she got here. How did she surrender the standards of the Christian faith on the altar of the funny money of a drug baron? It was obvious from the beginning that Ikegwuonwu did not prosper by the sweat of his brow. He had no factory or money tree anywhere. He was a career criminal that sold drugs and killed people who he perceived as threats to his ‘business’. The traditional ruler of Umeje, Igwe Fidelis Oruche, bestowed the ozo title, the highest chieftaincy honor in Igboland, on the crook. Ozos are custodians of the finest values and norms of the Igbo society: only men of sterling reputation are eligible to be inducted into that noble society. The Igwe inducted ‘Ikegwuonwu’ into the group regardless. In an interview with The Sun, Oruche said he awarded the title to ‘Bishop’ because the chap came back from South Africa rich. The color of the generous stranger’s money qualified him for the title. The Igwe even went on reveal his sympathy: he theorized that the shooting was caused by some town union dispute and not a drug war! It is the celebration of the person of drug pushers by the church and society that has made that line of trade of appealing. The affirmation and popularity drug dealers win by doling out a fraction of their filthy money inspire many jobless youths to try the ugly way. Many of them risk their lives in countries with strict drugs laws and get executed. The church must return to sanity. She must isolate drug barons not fraternize with them. She church must learn to be contented with the widow’s mite of humble and decent believers. And the Nigerian Police must stop fooling themselves. They had announced that they had arrested some suspects in connection with the shooting. The ‘Bishop’ of drugs who is an acquaintance of Governor Obiano was untouched. The drug baron is walking the street as a free man. He ‘visited’ survivors of the attack in the hospital the other day for photo-ops! You can reach Emmanuel at immaugwu@gmail.com or follow him on Twitter @EmmaUgwuTheMan.